Want some things knocked off your todo list? Check out our subscription plans and get started with Fancy Hands today. Unused requests from previous months rollover and accumulate as long as you're a member. Not only can we research products, we can purchase them for you too! You can set frequently requested requests to repeat so you can set it and forget it. Don't worry about the back and forth. We can make plans and manage your calendar. You can submit requests by phone, web, text, email or through our android and iphone apps. Invite friends and family to join Fancy Hands and get free credits for every signup. Have a quick request? Text it in to us and get it done ASAP. We use Google or Facebook as your Fancy Hands sign in. This does not give us access to your passwords, emails or allow us to post anything to your profile without your permission. This information will help us perform tasks for you with better results. It’s not required but is suggested to make the most of your subscription. Giving access to your calendar allows us to view, add, and edit events on your Google Calendar. So if you ask us to schedule an appointment and add it to your calendar, we can do that. We never have access to your password. This is not required, but the information allows us to better anticipate the things you need and the things you're going to want us to do. This information is kept private and used by our servers to help find task suggestions. Your assistants will not have direct access to any of this information. You've got a list of everything that needs to get done inside of Trello. 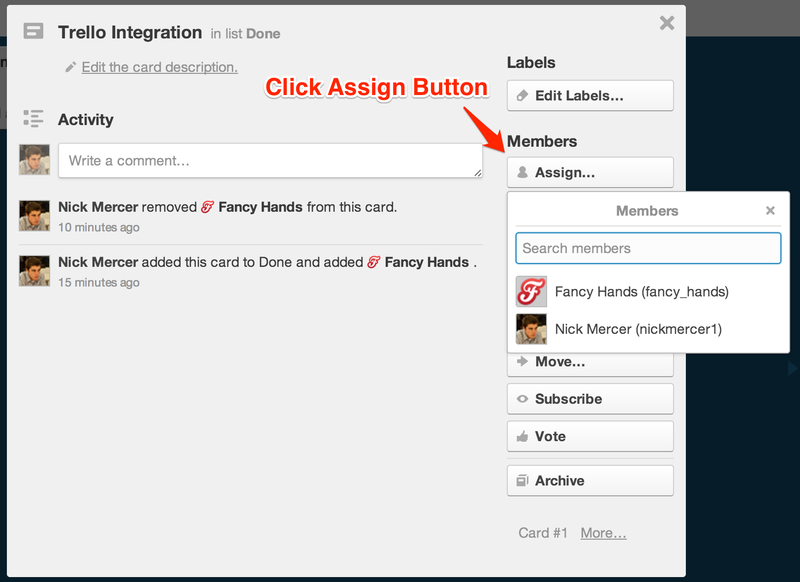 Sync your Trello account with Fancy Hands and let us do some of those things. Add us to your project. 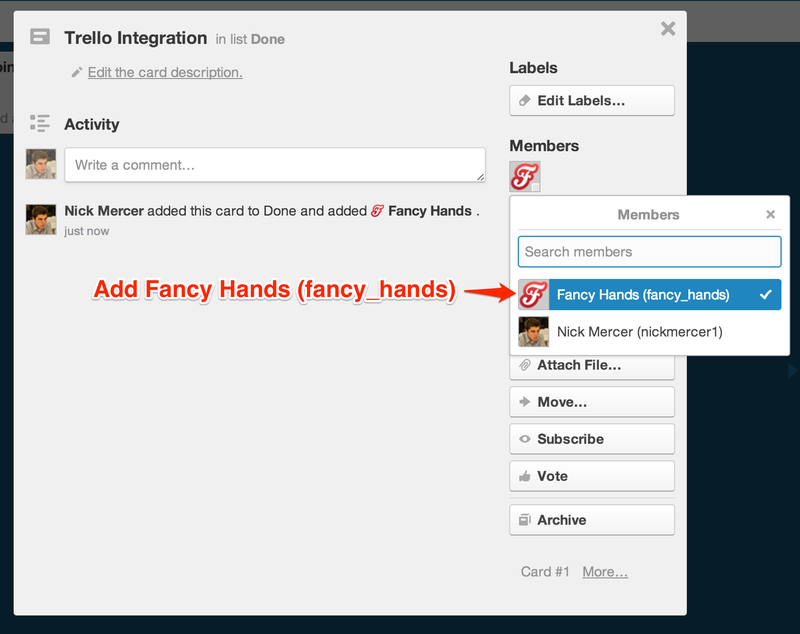 - (fancy_hands) - trello@fancyhands.com How? Pick tasks that you don't want to do. Assign those tasks to Fancy Hands. Relax as your assistants complete your tasks. How do I invite Fancy Hands? Pick a card to assign to Fancy Hands and click the Assign button. Add Fancy Hands (fancy_hands) to the card. Get the most out of Fancy Hands with these extras. As a member of Fancy Hands, you're always supported by a team of assistants, but with our Personal Touch feature, you can give the whole team one name. You can set up a custom email address so it appears you're always working with one assistant. This allows you to say in an email, for example, "I've cc'ed my assistant, George, who will schedule this meeting for us." This is less confusing for everyone instead of you saying, "I've cc'ed my awesome team of assistants at Fancy Hands." Once you set the Personal Touch feature up, all of our assistants will use that specific email address and name whenever reaching out to third parties on your behalf. What are you going to call your assistant? Looking Ahead is an email that we'll send you that helps you plan the days and week ahead. It's got your calendar, stats, tips, and suggestions for things that we can take off your plate. If you don't want it at all, simply click the unsubscribe link when it arrives. How often should we send it? This is not required, but the information allows us to better anticipate your needs and wants. This information is kept private and used by our servers to help find task suggestions. Your assistants will not have direct access to any of this information. We'll share your referral code to Facebook when you send us a request. For example, if we schedule a car to pick you up, we'll post "You scheduled a Car Pickup via Fancy Hands" to your timeline. No specific information will be shared. When your Facebook friends click on the link, you'll earn $15 for each signup that comes through that click (via our referral program). When you first submit a request, we send out an email letting you know that we got it. If you'd rather not receive these notifications, uncheck this box. Sometimes, when you ask us to do a task, we email someone. For example, we may email an associate of yours to set up an appointment, or inquire about pricing.  If you'd like, we can append your referral link to the bottom of the email. That way, every time we're working on your behalf, we're also working to get you a discount. We can hold two different billing options. One for your subscription fees and the other for when we make purchases on your behalf. Looking to upgrade, downgrade, or cancel your plan? We're glad we were able to help out. Share your success with your friends. You'll get a $15 Fancy Hands credit for each user who signs up using your referral link. We're sorry we couldn't help you out more. Please let us know what we could have done better so we can improve our service. We won't respond to every note, but we do read them all and appreciate the feedback. Unhappy with your request, or just want to let us know how we're doing? Please let us know so we can improve our service. We won't respond to every note, but we do read them all and appreciate the feedback. Awesome, buying a single task costs $6, sound good? This is going to the folks at HQ so that we can serve you better in the future. In the meantime, if you'd like to reply within your task and ask your assistant to keep trying, please do. Or you can shoot an email to support@fancyhands.com and ask your task to be re-assigned to someone new. Choose a plan and get things done! Standard requests are up to 20 minutes of work. Looking for a dedicated assistant? If you're looking for a dedicated assistant, let us know. Email contact@fancyhands.com about your needs and we'll get back to you as quickly as we can. See what's included | Need a dedicated assistant? Want to purchase a gift? Never lose a task again! As of 2/21/2014, your tasks now rollover! So if you've got some left at the end of this month, you can use them next month. Awesome, right? More info here. Your plan includes unlimited requests! The world is yours. We'll email the full transcript of this request to your selected recipients. A request is something you need done, that we can do for you. What is a standard request? What is a live request? Live requests will connect you with an assistant within one minute via SMS Text or web chat. One request credit is 10 minutes for live requests. What can our assistants do? We can also take care of your scheduling, purchase items items for you, research anything, make phone calls, compare prices, get you refunds, deal with customer service and much more!